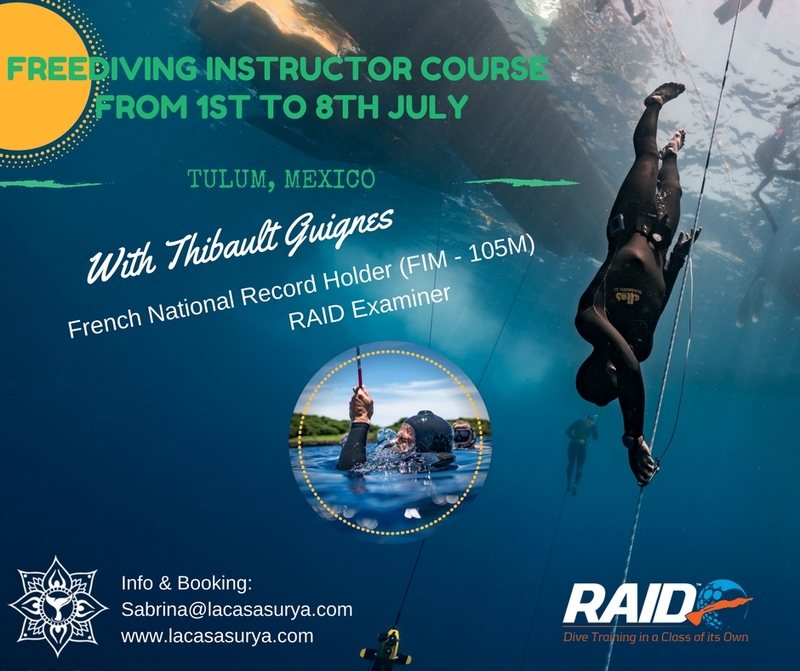 Come and join us for your RAID Instructor course with world class instructor trainer Thibault Guignés at Freedive Surya! From 1st to 8th of July, get ready for 8 days of training in the amazing Cenotes of Tulum, Mexico. Thibault is RAID Examiner/Instructor trainer, French national record holder (FIM - 105m), and owner of Freedive HQ Philippines. The RAID Instructor course will prepare you for your freediving career with classroom, confined, open water presentations and learning the proper teaching methods. Every instructor candidate has the possibility to join Freedive Surya, for a dedicated training to get ready for the course. Contact us for more information. Take the challenge and Live Your Dreams! Price: US$1,499 – includes all training and materials from RAID international, instructor certification, unrestricted access to manuals, transportation & access to the Cenotes. Book your course before 10/04 and receive a Free Octopus Noseclip! We can provide accommodation package as well, in a modern and comfortable house, with fan & AC. WIFI is included in your stay. It can accommodate 4 instructor candidates. © 2017 La Casa Surya. All Rights Reserved.